Happy New Year, everyone! Out with 2014, in with 2015, and hello to the promising empty slate of a whole new year. Are you making any New Years Resolutions this year? I won’t judge you if you aren’t. I think resolutions work brilliantly for some people, but I know a lot of folks burn out quickly and get upset with themselves for not accomplishing their goals. Some resolutions are easier to keep than others. That’s the key to success, really: don’t set your sights too high. Be a little vague in your resolutions to give yourself some leeway as to how you define “success.” Set goals that you will be able to stay with, and set goals with guaranteed positive outcomes. 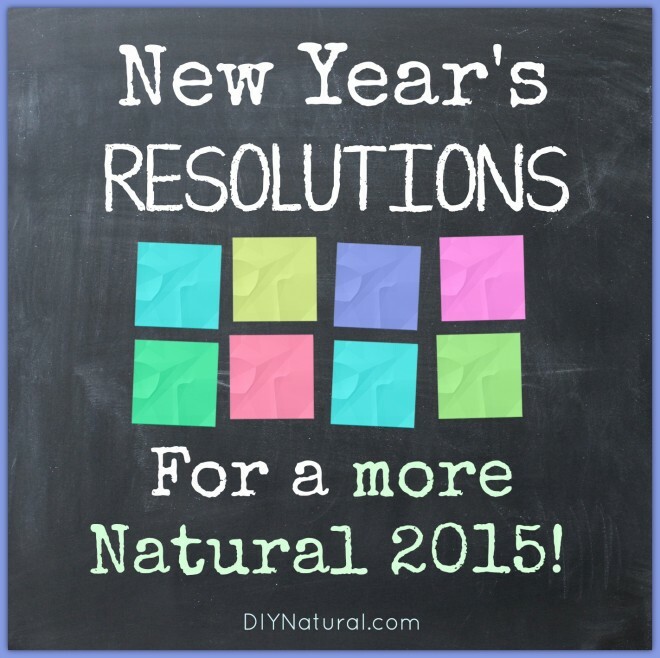 If you’re interested in living a more natural lifestyle, I have some great ideas for resolutions. These are all fairly simple, have great outcomes that will help your family and the planet, and you can pick and choose the best resolutions for you. Chances are you’re already doing some, if not most of these things, which is awesome! If you’re just beginning a natural lifestyle and you’d like to start fresh with the new year, I recommend choosing two or three of the following as resolutions that you want to implement in the coming year. Just two or three things. You can do it! 1. Make the switch to reusable shopping bags. Plastic grocery bags don’t seem like much of a problem at first glance. They’re small, so thin, and kind of handy to have around the house. But relying on plastic grocery bags has a much more drastic effect on the environment than you might expect. Plastic is a petroleum-based product, for starters, which means we should limit our use of them whenever possible. Plastic bags harm animals (especially sea creatures) and aren’t remotely biodegradable. Why would you want to bring home 10 of them every week? This year, try using reusable shopping totes. You can buy them or you can make your own. Either way, you will be limiting the number of plastic shopping bags you consume every week, and that’s a win for everyone! Composting might sound a little gross at first, and I’ll admit that it isn’t always convenient to collect all of your food waste separately from the rest of the trash. The benefits far outweigh the small hassle, though, and if you aren’t already composting, you should start now! One of the best things about composting, environmentally speaking, is that it keeps a lot of waste out of the landfill. Up to 40% of the waste in landfills is made up of stuff that could be composted. Imagine the impact we’d have if most people started composting! Besides the environmental benefits, composting makes for awesome planting dirt and fertilizer. 3. Cook at home when you can. I know it’s a busy world and we all have to feed our families, and for those reasons eating out can be appealing and convenient. Cooking at home is more work and more mess, but there are so many benefits to it. You can control the ingredients that go into your food, helping you gain more control over your diet. It’s easy to avoid eating unhealthy food when you’re having to buy it and cook it, but it’s pretty hard to avoid french fries when you only have to ask for them. Environmentally speaking, it’s much better to make one trip a week to a grocery store than to drive to a restaurant several times a week. It’s also easy to buy the best quality ingredients at a grocery store, making sure your family has the best nutrition you can give them. Betsy shared some of her tips for cooking at home here. 4. Ditch the plastic, go for glass (or stainless steel). Plastic isn’t so great for you. We all know that by now, right? BPA is a known endocrine disruptor, and pretty much the last thing you want to heat your food on or in. Even plastic that’s BPA-free isn’t perfect. If you’re still using a microwave, you need to avoid using plastic in it whenever you can. Glass plates, glass storage containers, and glass tumblers are the way to go in the kitchen. 5. Buy organic and local. Remember, these goals are supposed to be attainable, so of course I’m not suggesting you switch everything in your cupboard to organic. That would be great, but impractical and expensive, too. The idea here is to buy organic when you can. Organic farming methods are kinder to the earth and much more sustainable, so that’s the kind of agriculture we want to support. 6. Grow your own food. Not everyone has space for a garden; I realize that. But if you have a window with good light then you have all you really need to grow some of your own food. Window gardens and container gardens are increasingly popular in urban areas, and for good reason. There is nothing in the world that tastes better than a tomato fresh off the vine, and pretty much anyone can grow a tomato plant. If you have the space for a proper garden, even better! You can plant several different plants and grow yourself a whole salad. Growing your food means it can be organic, local, and convenient. You learn valuable skills, pass them on to your kids, and spend time outside. Throw in a small chicken coop, and you’re that much closer to self-sustainability. Now that’s a resolution to aspire to! To me, the heart of the natural lifestyle is the love of simple things. A garden, home-cooked food, used furniture, walks outside – all beautiful, underrated aspects of a simple life. Simplifying your life can take many forms. Maybe you need to de-clutter your house to help with efficiency, or maybe you can cut down on your cable package and spend more time reading. Replace social gatherings with family time. Skip the gym membership you’re going to bail on in a few months anyway and start walking outside instead. The simple life is the natural life, and they’re both beautiful. I hope you can start your year off with a happy heart, a clear mind, and a good attitude. That’s what resolutions should be about, anyway. Are you going to make any of these resolutions your own? Do you have any we should consider? I’ve always wondered are the plastic shopping bags worse for the environment then typical plastic garbage bags? I’ve actually never bought garbage bags and always just used my shopping bags for our trash. Is there a more earth friendly alternative to put your trash in? I put recycling in my paper shopping bags as well. My New Years resolution is to buy fresh or dried beans instead of using canned beans. As a cashier, I would like to comment on reuseable bags. Please wash them as needed. Its gross and disgusting to have to handle dirty bags. Dirty bags on the counter and on the bag carousel leave germs for the next customers’ bags. Also, don’t just plop them down on the counter. Help put them on the bag carousel if your store is arranged so this is possible. I’m so excited you have composting here, a kitchen compost is something I’ve wanted to start for a long time and it keeps slipping my mind! Thanks for the reminder!